I love reading Post Secret and when I saw the following secret posted, it pushed my blood pressure up. Nothing irks me more than a frugal person being crossing a moral line. Stealing coupons out of a paper, not leaving a tip when eating out after the waiter did a fine job, taking the refill cups out of the trash at the movie theater for free refills, taking home the TP rolls or any office supplies from work, buying an item at the store with the intention of taking it back for a refund after using it. I used to have my paper stolen outright and if web-cams had been common at the time I would have hooked one up to find out who it was and catch them in the act. Not only is the thief NOT being frugal but it hurts two other people, the person waiting for the paper or coupons and the paper delivery person. When I delivered the paper, if someone called in and complained that they didn't get a paper, I was docked the price of the paper from my paycheck. While I don't see going to the bulk food stores and only eating the samples as stealing because the companies do see this as a way to entice people to buy their product. But I do see a problem with going back for thirds or fourths and making a meal of it. Some people may see a fine line and others are gray area when it comes to crossing from frugality to thievery. Personally, I think most cases go into the common sense area which means that we need to listen to that small voice in our head that says, "This is going overboard. This is wrong." I believe most people are good people and will listen to that not cross that line, but it still boils my blood to see that some people have erased that line altogether by silencing the common sense and doing whatever they want because it is all about them. (1)In fact, I would go even further and argue that there is never too much frugality, as long as respect for others exists - what actually creates that line between frugal (good) and cheapskate (bad) is our other values. (2)Stealing is taking something from anyone - a business, a person, even a pet - an item that they’re not freely giving or selling. Thanks for taking the moral stand. Some people like to justify sin (not a popular word these days, but is often appropriate). The same person that would justify her stealing would be outraged at the person that stole from her. That is a good comment - "The same person that would justify her stealing would be outraged at the person that stole from her." I can't even *imagine* doing stuff like that! Taking a refill cup out of the garbage to get free soda? YUCK! If the movie is so expensive that you can't afford your own soda - then how about borrowing a DVD from the library for free and drinking all the soda you want at home! And yes, I have to agree with the comment above about the person stealing being appalled at someone stealing from them... Karma. I made my own coffee at home and was out of milk. My 3 year old had to go to the restroom and we stopped at a Starbucks. I briefly thought of using some of the creamer on the counter for my coffee from home. Then I realized it would be stealing. It really is all about that little voice in our head and being sensitive to it... good for you on doing the proper thing. Thanks for standing up for the paper carriers. I used to deliver papers myself and had to deal with a thief on one route. 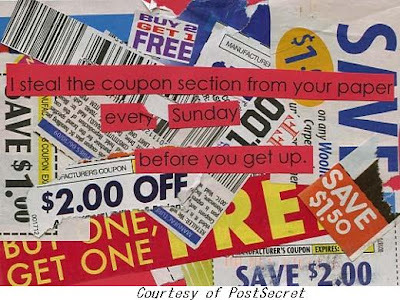 Why can't you just ask people for their leftover coupons when they are done reading the paper? I get plenty of extra coupons that way. Couldn't agree more. I'm working at a restaurant and can't believe how some people take advantage. It might cross into stealing, but things like asking for a bowl of lemons with your water then making lemonade at the table, ordering a from the children's menu then eating half a dozen biscuits with it. Just plain cheap. I always have coupons left over, I freely give them away to anyone or leave them in the break room at work. Wow, that is just cringe worthy!